Inadequate dental care is the most common cause of bad breath. Food residue, particularly in between the teeth (interdental spaces), plaque and tongue coatings provide putrefactive bacteria with plenty of living environments and food which helps them to multiply freely. In the process of the bacteria being produced, their waste gases intensify: the oral flora is disturbed, allowing the breath to smell unpleasant. So what is correct dental care and what further measures can be taken to eliminate putrefactive bacteria, therefore preventing impending bad breath (halitosis)? According to research, many people do not clean their teeth enough and / or not correctly. There is evidence for this statement, for example, the fact that on average a person in Germany only uses four to five tubes of toothpaste each year. The actual amount necessary according to expert opinions, is seven tubes per person per year. In reality, the use of these teeth cleaning materials is frequently far below the recommendations. Daily brushing is the basis for healthy teeth and gums. This is something that all dentists agree upon. Teeth should be brushed at least twice a day, or even better three times a day: in the morning, at midday and in the evenings (after the main meal times; breakfast, lunch and dinner). However, people also play fast and loose with the time spent brushing their teeth: Above all in the evenings, when brushing your teeth is particularly important, many people brush their teeth for less than a minute even though you should brush them for at least two. You should not brush your teeth straight after consuming acidic foods or drinks, like an orange, for example. In this case, anyone that doesn’t wait for at least 30 minutes to an hour between eating or drinking and brushing their teeth, risks brushing away any tooth enamel which has been affected by the acids. If you don’t want to use dental floss, you can fall back on interdental toothbrushes or dental sticks. There has been a lot of discussion about choosing the perfect toothbrush for cleaning teeth. There are studies which have confirmed that electric toothbrushes are the most successful in terms of plaque removal. However, electric toothbrushes are not suitable for everyone. For example, they aren’t really recommended for use by small children. Anyway: Electric toothbrushes reduce brushing time to two minutes, you need three minutes with a manual toothbrush to achieve a comparable result. Either way: In any case, care must be taken to ensure that softer bristles are used. Hard bristles lightly scratch the tooth enamel and damage the gums. 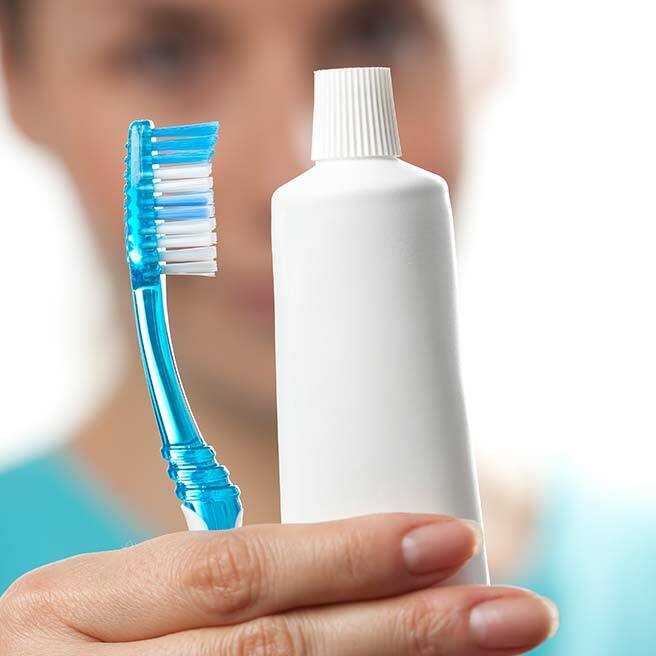 Oral douches can supplement tooth brushing but should not replace it, under any circumstances. There is no way around using a toothbrush. You should always brush your teeth with the same hand movements, as only then will you remember it as a daily routine. To begin, rinse your mouth with clear water. The water should move in between and around your teeth. Brushing with a toothbrush should be done following the C-O-I order: Chewing surface, outside surface, inside surface – always go from red (gums) to white (tooth) in circular movements (electrical toothbrushes do this automatically). Of course, the perfect tooth brushing method also needs to be accompanied by the right toothpaste: It should contain fluoride and not be too abrasive (sanding effect), to ensure that the tooth enamel is not damaged. As most bacteria settle on the rough surface of the tongue, like the bacteria that cause dental caries for example, cleaning the tongue after brushing your teeth is now widely accepted and is particularly important when it comes to dealing with bad breath. The process is very simple: The tongue is “wiped” with a tongue scraper or teaspoon, always from back to front. During and after the cleaning process, the tongue cleaner is cleaned with water. Interdental toothbrushes, dental floss or dental sticks should be used at least once a day – preferably in the evening, before or after you brush your teeth for the last time that day. Which dental floss you prefer to use depends on you personally and the individual preferences that you have discovered through testing different types. It doesn’t matter if it is waxed or unwaxed, flavoured or not, by the meter or already strung on special holders, the most important thing is the method that you use to use the floss. Even if you clean carefully and regularly, you can only reach around 70 percent of the tooth's surfaces. The remaining 30 percent can only be reached by professionals: Dentists or dental hygienists. The Bundeszahnärztekammer [The German Dentists Association] recommends that you get your teeth cleaned professionally every six months. There are also patients who may require professional dental care at shorter intervals. Professional teeth cleaning is not a cosmetic measure but a fundamental part of caries prophylaxis. Particular care must be taken to avoid caries and bad odours if you wear braces or retainers. Your dentist will give you more specific information about this subject. Important: Whilst, for the most part, private health insurance covers the cost of professional teeth cleaning, people with state health insurance must pay for this procedure out of their own pocket. However, most supplementary dental insurance also covers the costs for this professional dental care. Learn more about bad breath and mouth odour here. What you eat also plays a role when it comes to bad breath and dental care. The notorious smells of garlic and onions are particularly problematic.